You can’t truly experience Southwest Washington without taking in the trails, historic sites and attractions that make the area truly wonderful. These are only the highlights, and you’ll find many other gems as you travel through the area. Consider adding these stops to your itinerary as you explore Lewis County and beyond. The Veterans Memorial Museum showcases the personal histories of veterans from Lewis County. Several events throughout the year pay tribute to people from across our region who have served overseas and in support roles in armed conflict. Housed in a 1912 Northern Pacific Railroad depot in downtown Chehalis, the Lewis County Historical Museum is dedicated to the preservation of the history and heritage of Lewis County. The museum is also home to a local model railroad club. This private collection includes original and fully restored pre-1916 Indians, Harley-Davidson Excelsiors and other vehicles and bicycles. It’s a stunning testament to America’s love of horsepower. The museum is open from 9 a.m. to 1 p.m. on weekdays or by appointment. Admission is $5. The 1845 Jackson House was the first pioneer home built north of the Columbia River. It’s located near Lewis and Clark State Park. Take U.S. Highway 12 to Mary’s Corner and turn south on Jackson Highway, where you’ll see it just off the side of the road. Once the religious centerpiece of a town that is no longer, St. Urban Church opened in 1891. It was restored in 2010 after having been slated to be destroyed. A cemetery from years past sits behind the structure. Built in 1858, the Claquato Church is thought to be the oldest Protestant church in the Pacific Northwest and it’s included on the National Register of Historic Places. The church also hosts some events throughout the year, including the Lewis County Historical Museum’s Pioneer Pie Social in the summer. This 101-acre park includes the 1860s Borst Home, a one-room schoolhouse replica as well as the Fort Borst blockhouse. Admission is $2 for adults, $1 for children aged 5 to 12 years and $10 for families (Borst Home admission). Head west on Harrison Avenue in Centralia. Turn left on Johnson Road, go past the middle school and swimming pool. Follow the signs to the Borst Home. McMenamins Olympic Club remains one of Centralia’s most popular destinations — that’s not surprising since it comprises a restaurant and bar, a hotel and even a movie theater. If you go, be sure to pick up some locally brewed beer to go. The towns of Mayfield, Riffe and Kosmos are located under Riffe Lake — a result of building the Mayfield and Mossyrock dams in the 1960s. You can see the towns if the water level is low enough. The park is popular for camping and fishing. Nearby Dog Mountain is a mecca for hang-gliders. More than 4,000 years ago, the Cowlitz and Yakama tribes inhabited the area — an interpretive display is at the park with more information about the location’s history. Thousands of people visit the Chehalis-Centralia Steam Train and Museum each year, and for good reason. 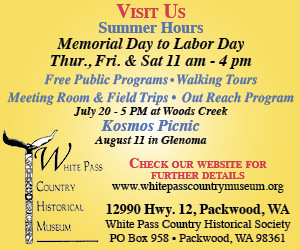 The facility, located along Interstate 5 near the Veterans Memorial Museum at 1101 SW Sylvenus St, Chehalis, offers special rides on its antique locomotives throughout the year. Rides take passengers through the rolling fields and countryside of West Lewis County. The regular season includes Saturdays and Sundays from late May through September. Trains leave the station at 1, 3 and 5 p.m. on Saturdays, 1 and 3 p.m. on Sundays. There are also special events throughout the year, including dinner trains, Easter trains and Santa trains. Get all the details online at www.steamtrainride.com. 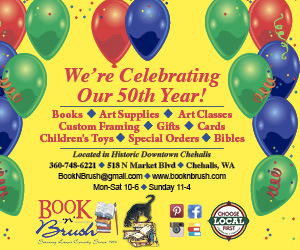 Call (360) 748-9593 for additional information. Wolf Haven International is hidden away as a sanctuary should be, but certainly worth the short drive north of Tenino. 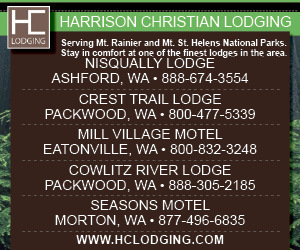 But to visit, contact the sanctuary way ahead of time and make a reservation. Its mission is to “Conserve and protect wolves and their habitat.” The sanctuary has taken care of 180 displaced captive-born animals since 1982. The nonprofit Wolf Haven accomplishes this mission through providing sanctuary, education and conservation. Wolf Haven rescues and provides sanctuary for displaced, captive-born wolves, offers educational programs about wolves and the value of all wildlife, promotes wolf restoration in historic ranges and works to protect our remaining wild wolves and their habitat. Enjoy a 50-minute guided visit through the public portion of the wolf sanctuary. During your guided walk, learn about wolves, both in captivity and in the wild. Potentially see up to 10 sanctuary residents in a beautiful, natural and serene atmosphere. A self-guided prairie walk and stop at the memorial wolf cemetery are optional. For the gearheads, the South Sound Speedway just off Interstate 5 at Rochester offers a racing season full of roaring engines and more than a crash or two. The .375 mile oval race track includes a figure eight course with racing most Saturdays through September. The South Sound Speedway, located at 3730 183rd Avenue S.W. 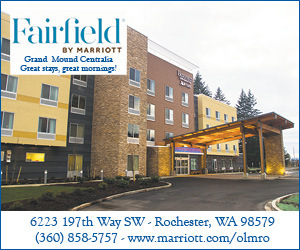 in Rochester, can be accessed by taking Exit 88 and going east on Old Highway 99. Most races take place on Saturdays, although there are a few on Sundays. A giant egg that bills itself as the world’s largest pays tribute to the towns days of being home to a chicken co-operative. Lucky Eagle Casino and Hotel offers some of the finest entertainment experience in the Pacific Northwest. It also has the largest variety of slot machines and table games in the area, plus world famous entertainers and an attractive 171-room hotel. Perhaps the most well-known shopping opportunity in the county known to people outside the local area, the Centralia Factory Outlets, offers more than 30 outlet stores on both sides of Interstate 5. Nike, Under Armour, Coach, Polo Ralph Lauren, Van Heusen and more represent a variety of stores that offer discounted pricing on name-brand clothing and more. But there’s more to the shopping scene in Centralia than the outlets. A renewed economic landscape in the city’s downtown core has resulted in business activity increasing among locally-owned stores that offer everything from antiques to books and a whole lot of other stuff in between. And if you’re fortunate enough to visit downtown Centralia on a Saturday, check to see if the Fox Theatre is hosting one of its many entries in the Fox Theatre Film Series. The theater, which was once the place to be in Centralia for movies and silent films, is regaining its status as a cultural and arts center of the Hub City through a revitalization project that continues. Once a mega-store that carried everything from clothing to pets, the building that housed it has now been repurposed into a home for several small shops comprising the largest swap meet in the region. The Yard Bird itself, the giant structure greeting people on National Avenue, has been voted KING 5 Evening Magazine’s Best Roadside Attraction. If strolling through 30 acres of tulips sounds like a nice way to spend an afternoon, consider visiting the family-owned DeGoede Bulb Farm and Gardens, located just off U.S. Highway 12. The family first grew flowers in Holland, then later moved to Mount Vernon, Wash., and finally to their current location in Mossyrock. There are also 100 greenhouses, a garden center and a show garden with a pond and waterfall. This 72-acre hillside is dense with second-growth trees and carefully tended hikes. Even in the heat of summer, the canopy of fir, maple and cedar keeps the trails cool as trillium. Maidenhair ferns and other natural wonders flourish around you. Enter on the eastern edge of downtown Centralia at the corner of Locust Street and Barner Drive. This trail is actually northwest of Centralia, but it contains a beautiful stretch of the Chehalis River. Watch for bald eagles overhead and plan to pick blackberries if you visit in late July. Enter from Goodrich Road off Old Highway 99. Known locally as the “rails to trails,” this 56-mile-long path runs from Chehalis to the Pacific Coast town of South Bend. Partially paved, the trail runs through farmland and winds up the Chehalis River Valley and into the namesake Willapa Hills. The DeGoede family, devout Catholics who settled in Lewis County and raise tulips, made a trail on a hillside near Mossyrock leading from a humble chapel to a grand 50-foot-tall cross built on a bluff overlooking Lake Mayfield. The trail is adorned with a painting depicting the 12 Stations of the Cross. Directions are available at DeGoede Bulb Farm and Garden, (360) 983-9000.